These days keeping kids safe while allowing them to explore and discover the world around them is a tough balancing act. Do you let your kids explore and play freely, or do you find that letting go of the reins slightly fills you with fear and dread? Keeping kids safe is so important, but taking risks is an important part of child development. Think about it. Babies take risks when they are learning to walk. They try it, then go a step too far and fall down. But they soon learn that falling is okay, and they learn from it. The best way for kids to learn about taking risks is being taught how to manage them. You can teach them how to do something in a safer way, rather than telling them not to do it at all. If all you do is warn them off something, they won’t learn why you’re telling them not to do it and they’ll only want to do it anyway once your back is turned! Taking risks makes kids more confident, independent, and creative, which are all important skills to have later on in life. If they grow up to be very risk averse, they won’t try new things and they might not reach their full potential because of a fear that something bad might happen. Most kids won’t take much notice if you tell them that they shouldn’t have done something after the event. The best way to teach them about risk is to talk to them as they are doing whatever you think is risky. So for example, if they are building a fort or a den and they’re using things like boxes, plastic or wooden crates, or planks of wood to build a structure, they’re likely to be lifting, balancing, and manoeuvring heavy or awkward items. Talk to them about how to lift and carry items safely, and ask questions about whether the item is too heavy for one person to lift, how they are going to stack it, and whether they think it will be safe. Don’t spoon feed them any answers, but ask questions that will encourage them to think so they learn for the next time. You usually wouldn’t consider mixing kids with things like staplers or scissors, but it’s a good idea to teach them how to safely handle and use them as a way of managing the risk if they ever come across them ‘accidentally on purpose!’ Sit quietly with them and demonstrate how the items are used, then gauge how well your child is able to focus before you let them handle them. 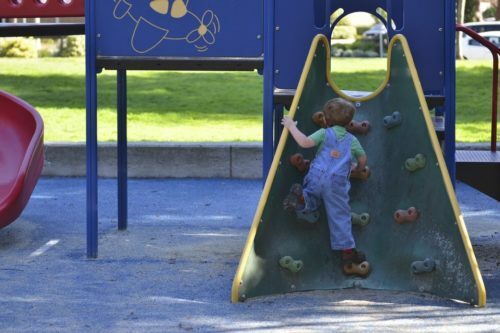 So next time your child is climbing, jumping, or doing something you think they shouldn’t, think about whether they’re actually learning anything by doing it, and whether you can do anything to help manage the risk. The reward will be more confident, independent children who aren’t put off by fear, which can go a long way in today’s world.